NO ONE SEEMS TO EXPECT BIG THINGS FROM RAM. Sure, the trucks formerly known as Dodge have a fan base, but the full-size pickup market remains a battle between Ford and Chevy. The Ram 1500 may not be as much of an outsider as the Toyota Tundra and Nissan Titan, but it’s not quite in the inner circle. 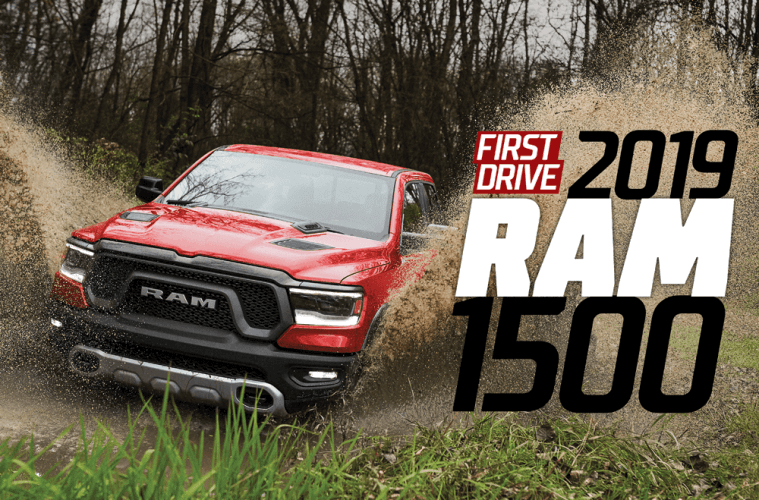 For 2019, Ram is introducing an all-new 1500, and it’s a truck that should make Ford and Chevrolet sit up and take notice. 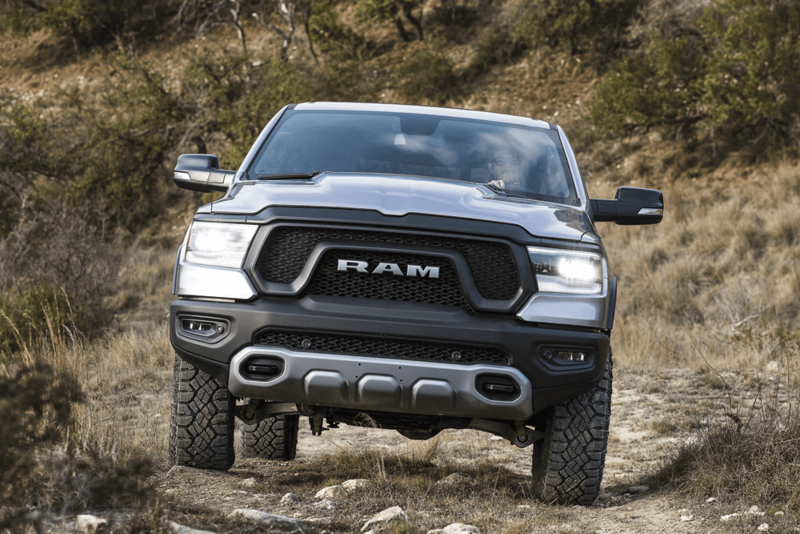 While the Big Two have been fi ghting with each other, Ram has been sneaking up from behind, and what the company has come up with may well be the most compelling new truck on the market. 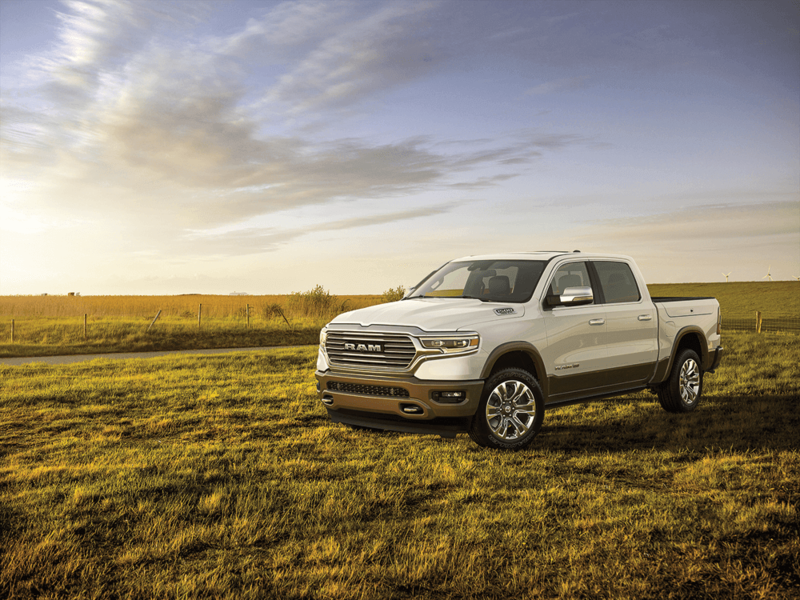 The 2019 Ram 1500 off ers fresh styling, higher towing and payload capacities, a stronger frame, a new “mild hybrid” powertrain and a lot more. 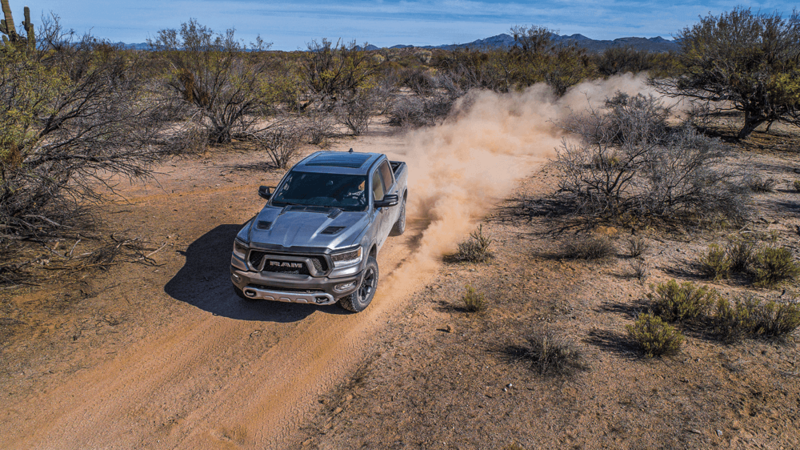 Ram is building on a theme that started with the previous-gen Rebel and Power Wagon by giving each trim level—Tradesman, Laramie, Big Horn, Rebel, Long Horn, Limited—its own front-end treatment. Top-of-the-line Limited models feature a chrome-coated nose that gives the truck a more than passing resemblance to the Durango. Your author prefers the black grille on lesser trim levels, not to mention the Rebel, which looks like a bull about to charge. There are plenty of changes under the Ram’s new skin. High-strength steel now accounts for 98% of the beefed-up frame as well as about 50% of the box. 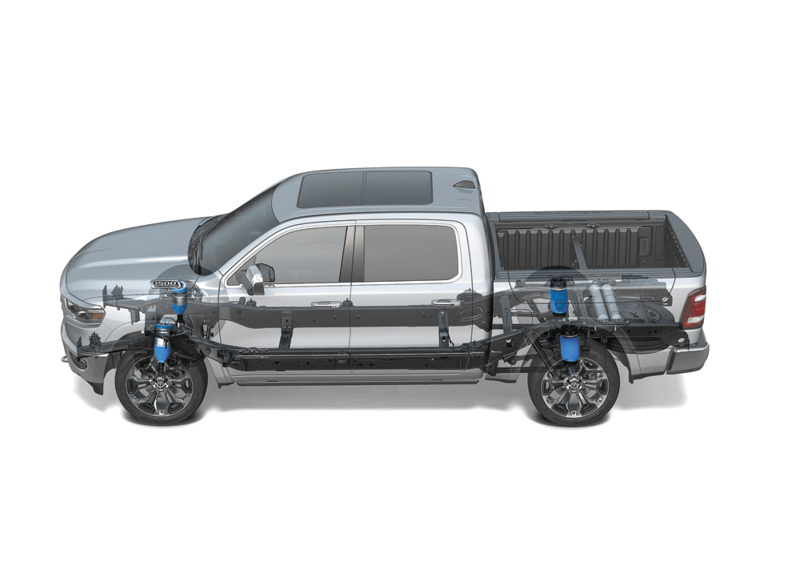 As a result, capacities are up: The Ram 1500 can now be equipped to haul up to 2,300 pounds in the bed and tow as much as 12,750 pounds. The brakes are bigger, and the wheels have gone from five to six lugs. Meanwhile, an aluminum hood and tailgate help keep the new Ram 1500’s weight down. The new truck is larger as well. Both wheelbase and overall length increase 4 inches, with most of that space going to the cab; we noticed (gratefully) the additional backseat legroom in both extended and crew cabs. The walls of the bed are now 35mm higher, which helps to improve the truck’s aerodynamics, and a two-step bumper makes it easier to get into the bed. The tailgate is dampened, and the Rambox lockable storage bins in the side-walls are still on offer. 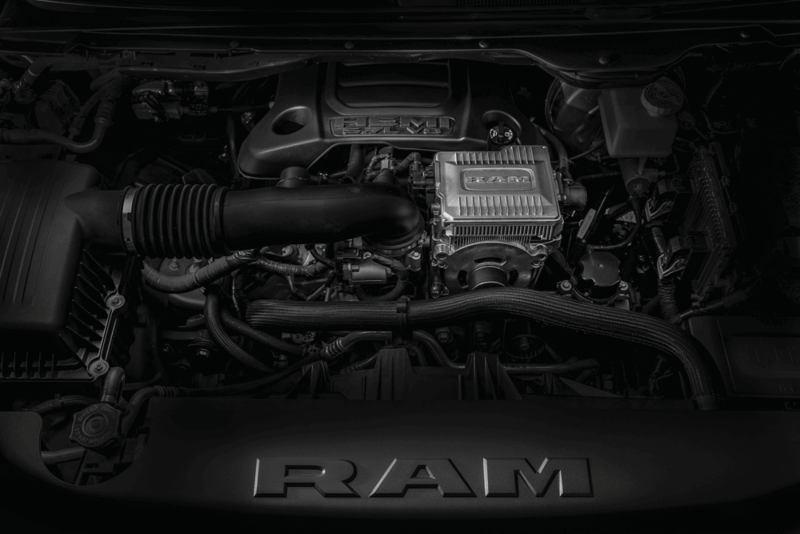 The most surprising news about the Ram 1500 is the standard-fit 48-volt eTorque mild hybrid system that will be fitted to the entry-level 3.6-liter engine. It delivers a 90 lb-ft boost to the engine’s 305-hp and 269-lb-ft rating, and it does so at lower engine speeds (between idle and 1,500 rpm), below where the gas engine develops peak torque. Unfortunately, the powertrain wasn’t ready for our press preview, so we had to be satisfied with the big 5.7-liter Hemi V-8 and its 395 hp and 410 lb-ft of torque. 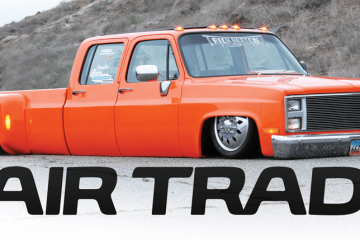 (Oh, the sacrifices Street Trucks makes for its readers …) The eTorque system will be offered as an option on the V-8 as well, providing a 130 lb-ft boost. 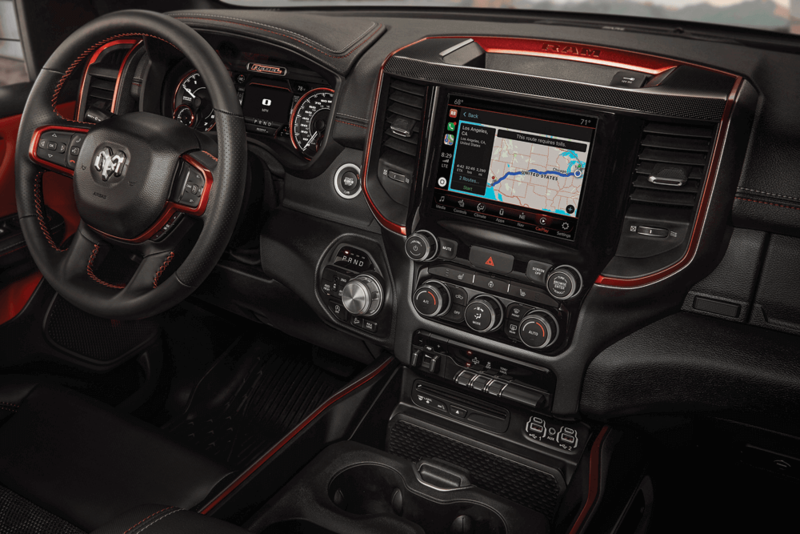 The Ram 1500’s best attribute may well be its cabin, which is a far cry from the cheap-o plastic interiors for which Ram trucks were once known. Interior differs greatly by trim level; even the font on the video-screen speedometer for trucks so equipped is unique to each model. An optional 12-inch portrait-style screen, reminiscent of the one found in Teslas and Volvos, may well be the killer app, though most Ram 1500s will likely be equipped with the smaller 8.4-inch UConnect system we’ve come to know and love in the current-gen Ram. 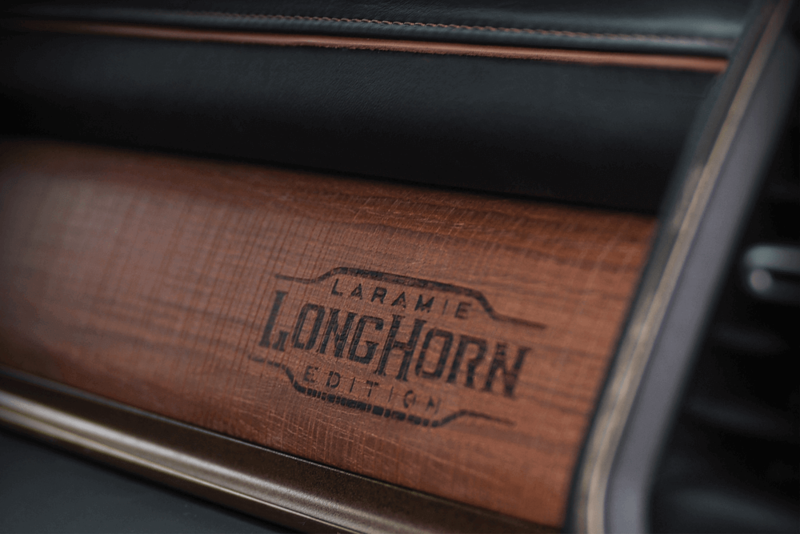 We loved the Long Horn, which features open-pore textured wood (first time we’ve seen that on a truck!) and intricate scrollwork on the gauges, but even the plain black interior in the mid-level Laramie we drove looked good to us. 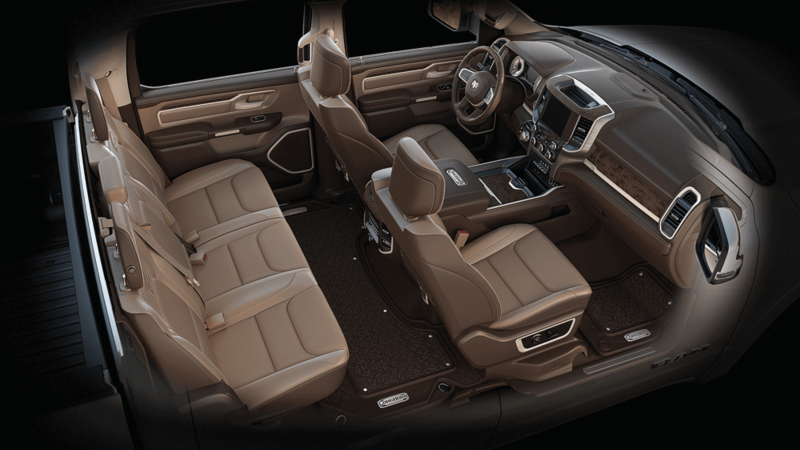 Our favorite interior is that of the Rebel, which lifts a cue from corporate sibling Jeep with red trim throughout. Like the latest crop of Jeeps, the Ram’s cab is full of Easter eggs. We found an illustration of four generations of Ram pickups molded inside the center console, and the optional wireless phone-charging pad is called the Ramcharger (a reference that might be lost on readers under 35). So how is the new 1500 out on the road? Very good—in fact, we’d argue that it’s the best ½-ton daily driver on the market (though we’ve yet to try the new 2019 Chevy Silverado and GMC Sierra). Ram remains the only truck manufacturer to offer a full air suspension, which does wonders for both ride and handling. Should you be so inclined, you can fling the air-sprung 1500 around corners as if it were a car. Steering is responsive and direct, and the ride, while offering just enough sharp up-and-down movement to remind you that you’re in a truck, is smooth and composed. Unfortunately, it’s offset by the front seats, which felt hard and flat. 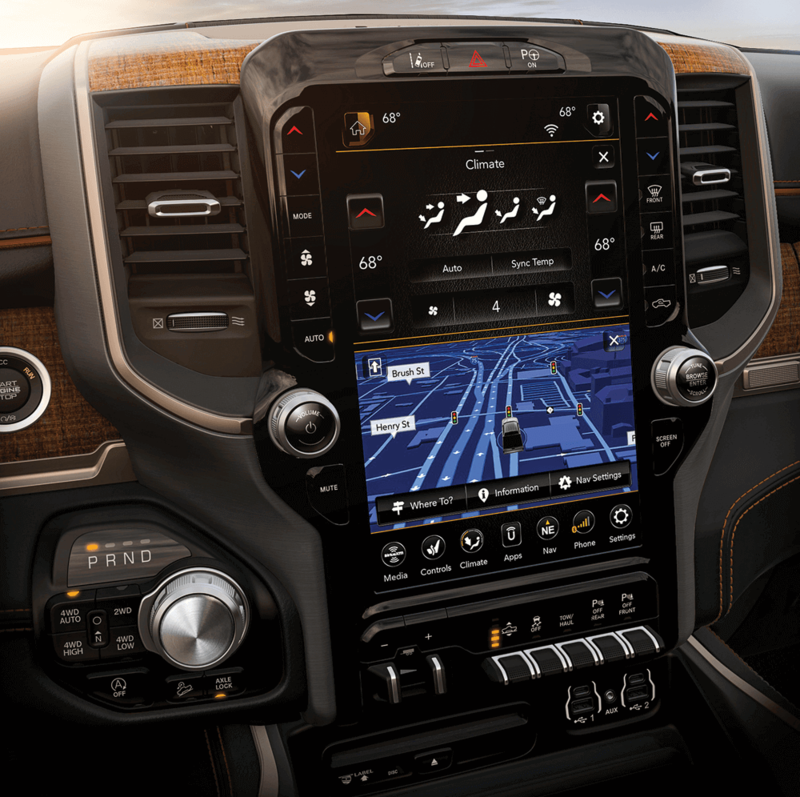 The first Ram 1500 we sampled had the 8.4-inch UConnect system, and we were pleased to see a full complement of redundant buttons and switches. One of our biggest complaints about the old system was that you had to scroll through menus when trying to access some secondary functions, but there are now enough buttons on the dash that you can turn down the AC while leaving the moving map on screen. There are even separate buttons for the seat heaters. The big 12-inch screen is impressive, and we especially like the giant map view. Unfortunately, it has the same problem as the old system: The big screen occupies real estate where those buttons ought to be. We advise ogling the 12-inch screen in the showroom and buying a truck with the smaller 8.4-inch display. 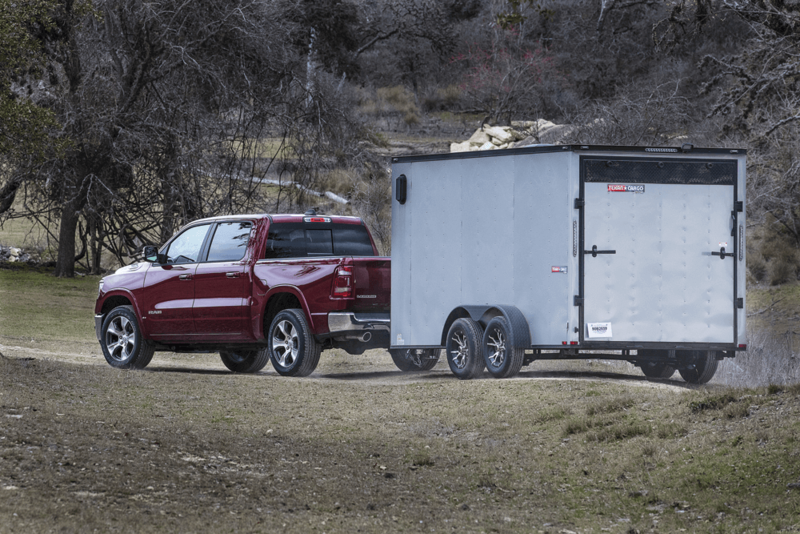 We did get a chance to tow a 4,000-pound trailer with the new Ram and noticed improved stability, though acceleration wasn’t as strong as we expected given how well the Hemi V-8 performs when the truck is running light. We did like the new blind-spot monitoring system, which can automatically detect and compensate for trailer length. All you need to do is make a 90-degree turn, and the system will automatically measure the trailer. From that point forward, an icon in the mirror will warn you if there’s a vehicle next to either the truck or the trailer. Pricing for the Ram 1500 will start at $33,340 (including a ridiculously high $1,645 destination charge) for the Tradesman trim, with top-of-the-line Limiteds starting at $54,340. Ram flashed us a few of the option prices, and they aren’t cheap: $1,795 for air suspension, $995 for Rambox storage, and $1,195 for the V-8. Check enough boxes, and this could become a seriously expensive truck.